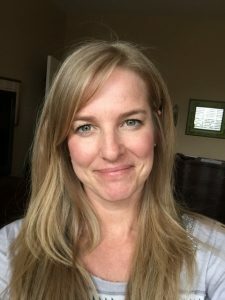 Beth Teliho, author of the new book, Order of Seven, <—- which you can order here), recently took some time out of her busy schedule as wife, mom, and writer extraordinaire, to answer a few questions about herself and her writing, I was lucky enough to get a spot on her blog tour to ask her a few of those questions. Beth is a funny, genuine, and sweet person, she is also a talented weaver of words. When I received my advanced copy of Oo7, I began reading right away, and I kept on reading until the last line whispered me farewell. I was sad to say goodbye. It was good, really good, and I wanted to read more. You can read my review here . After the Q&As, there’s a link you might wanna check out, it’s a giveaway! An autographed Oo7 bookmark, signed by me – No, no, no – signed by Beth, of course! You can find Order of Seven on Amazon, it comes highly recommended, just check out these reviews. How old were you when you discovered you had a love for writing? I’ve been writing stories in my head since I was seven or eight. It just never occurred to me to write anything down. I always had my nose in a book and was a big time daydreamer. Once I got to junior high and high school, I thought about writing all the time, but wasn’t really encouraged in school back then, and assumed writing a book was this unattainable thing reserved for the super smart. It wasn’t until college when professors praised my writing and encouraged me to take it further that I ever thought it was possible. Just goes to show you how much someone believing in you can be the thing that propels you forward. That encouragement was a game changer. It’s obvious you put a lot of research into your book, how long did it take you to complete? Nearly four years, but I didn’t write for a lot of those months. I often get too absorbed into the story and can’t see out of it, so I’d walk away for a month…or five, and then resume with a clear head. The research was so fun! That’s one of my favorite things about writing. One of your characters, has beautifully described tattoos, do you have any inked beauty yourself? Yes, I have three: a yin yang, a Celtic sun, and a kokopelli. I think about getting more all the time, but have yet to decide on design and placement. Someday…. Have you begun penning your readers a sequel? Any advice for writers thinking about entering the world of publishing? Invest in large quantities of wine. Just kidding. Maybe. But seriously, reach out to other authors! It’s so much easier with some advice and guidance. The writing community is the most supportive in the world. Get into a writing group where you can beta read each other’s work and also get advice if needed. Paper or plastic? Neither. I bring my own bags…when I remember. Coke or Pepsi or Dr. Pepper or . . .? Corona. Ketchup or mustard? Ketchup, or sometimes both if I’m feeling wild. Favorite Thanksgiving food? It’s all about the stuffing. First item on your bucket list? Write a novel, which has a pretty little check mark next to it now. Want an autographed Order of Seven bookmark? Click the link below and you might just be a lucky winner! Order your copy now! Available in paperback and on Kindle! BETH TELIHO is a writer, artist and tree hugger who lives in Texas with her husband and two adventurous sons. Restless in the mundane, she writes about the abnormal, paranormal and otherwise fantastical because that’s what quickens her heartbeat. She laughs at inappropriate jokes, and prefers spicy food and margaritas to almost anything. One day, she hopes to live in a treehouse, where she can be an eccentric introvert with at least seven cats.